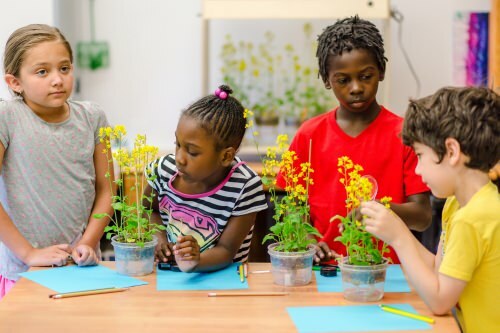 A UW–Madison program built around plants that mature quickly enough to engage the scientific curiosity of elementary through college students is releasing two new varieties that make the popular plants even better suited to classrooms. The Wisconsin Fast Plants are relatives of cabbage and broccoli that progress from seed to plant to flower in just 14 days, then on to seed by 40 days. Introduced by plant pathologist Paul Williams in 1987, the plants allow students to explore the effects of cross-breeding. In a single semester, students can emulate the experiments that Gregor Mendel used to set out the elementary principles of inheritance. One of the new varieties clearly shows the successful transfer of pollen, which fertilizes the egg to start breeding and reproduction. The second variety shows, within a week, whether genes have moved, allowing quick interpretation of the effects of breeding different plants. These speedsters help teachers satisfy new science standards related to inheritance, and the growth and development of organisms, but the roots of Fast Plants are much deeper than that. Williams, who was hired at UW–Madison in 1962 as a cabbage specialist to support Wisconsin’s vibrant sauerkraut industry, began collecting and cross-breeding thousands of Brassica varieties from around the world. Brassica is a broad genus that includes mustard, cabbage, rutabaga, broccoli and rapeseed, the source of canola oil. Members of the genus are also called crucifers, after the shape of the flower. Williams started breeding that plant in a way that eliminated some genes unrelated to early flowering while favoring a short, stocky stature suited to the classroom and research laboratory. The eventual result was a plant that would flower within 14 days of planting, and yield a crop of seeds within 40 days. With support from the National Science Foundation, Williams tapped science teachers to develop a curriculum based on the fast Brassica, and in 1987 initiated the Wisconsin Fast Plants Program to spread the word — and the seeds. 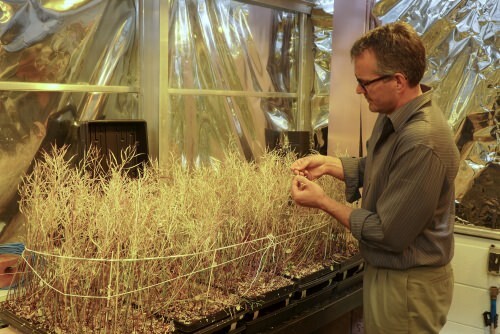 Fast Plants are licensed to Carolina Biological Supply, based on seed that is still cultured at UW–Madison. Dan Lauffer, Williams’ successor, estimates the plants are being used in at least 20,000 classrooms to teach genetics, biological development and evolution. The Rapid-Cycling Brassica Collection is a component of the Fast Plants Program that makes about 190 strains of Brassicas available to researchers. The original patent on the fast-cycling Brassica, held by the Wisconsin Alumni Research Foundation, has expired, but WARF maintains the Wisconsin Fast Plants trademark, so it continues to earn money on Williams’ discoveries and leadership. 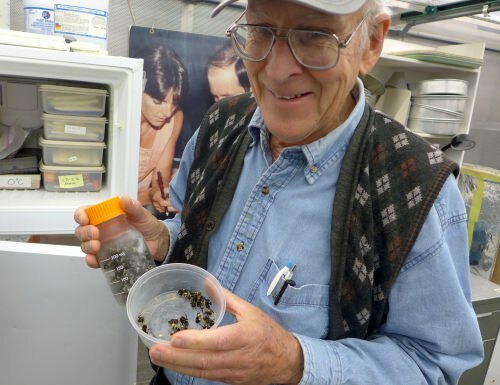 Williams, who retired 18 years ago, and Lauffer continue to breed Brassicas at the Biotron building on campus and in Williams’ basement, working to keep Fast Plants relevant. In this digital era, “next generation” is much on Williams’ mind, as he persists at producing and promoting plants that portray some of the wonders of biology. All it takes is a cup, soil, water and light — and some amazing seeds.